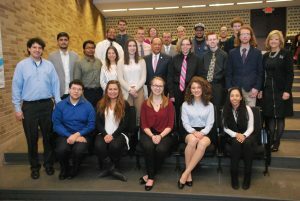 SOUTHFIELD – Lawrence Technological University has hit triple digits in its annual Research Day. 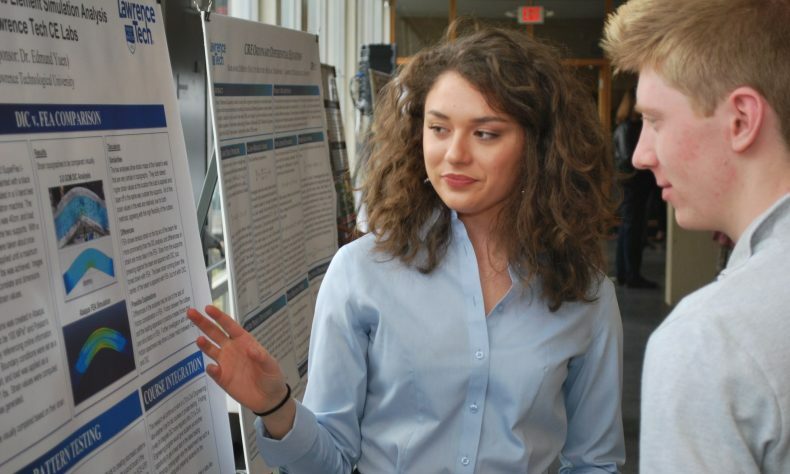 More than 100 research projects by undergraduate and graduate students and faculty were presented Friday, according to Research Day chairman Matthew Cole, associate professor in LTU’s College of Management. The total included 86 poster presentations and 16 oral presentations – a record. Topics presented varied widely, from experiments on the toxicity to zebrafish of chemicals used in plastic bottles, to improvements in virtual testing of advanced materials, to the design of college curricula. This year’s Research Day was supported in part by a grant from the Howard Hughes Medical Institute. 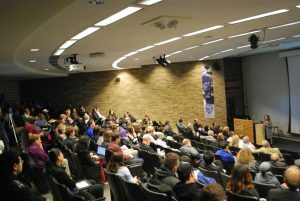 LTU is one of only 23 schools across the country, and the only one in Michigan, to receive an HHMI grant to boost diversity in scientific and technical fields through increased involvement of undergraduates in research, particularly undergraduates from historically under-represented populations. 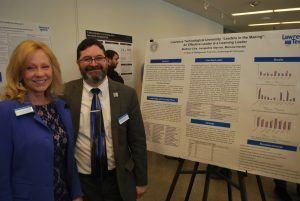 Matthew Cole, Research Day chairman and associate professor in LTU’s College of Management, poses with M. Therese Jamison, director of LTU’s nursing program, at the university’s Research Day Friday. Lior Shamir, associate professor of mathematics and computer science and one of the leaders in the effort to secure the HHMI grant, noted that involving undergraduates in research has been shown in studies to lead to higher grades, higher identification as scientist or engineer, greater retention in the STEM (science, technology, engineering and mathematics) disciplines, a shorter time to graduation, and greater interest in postgraduate education. Also at Research Day, Meng Zhou, assistant professor of chemistry, and Christopher Cartwright, associate professor of mathematics, presented on how they integrate research experiences into undergraduate courses. More about LTU’s efforts in course-based research at www.ltu.edu/blogs/cre. Research Day also includes the LTU Presidential Colloquium, in which a faculty member is honored for their research efforts with a keynote presentation. This year’s honoree was Patricia A. Castelli, professor in the LTU College of Management. In her speech, Castelli, a nationally renowned writer and researcher on leadership, shared her journey through education and research. Research Day honoree Patricia A. Castelli, professor in LTU’s College of Management, shares her journey through scholarship and research. Castelli described how an originally indifferent student from Warren, suffering what is now known as dyslexia, wound up with a PhD and consulting for global organizations like General Motors, Whirlpool and the United States Army. She’s now trained more than 30,000 people in a variety of organizational settings. Castelli then moved to Chicago, worked as a waitress, but volunteered to job-shadow a food and beverage director at a high-end hotel to learn about inventories and budgets, and eventually got a job in management – and picked up a bachelor’s degree from Roosevelt University in Chicago in 1987. She then founded a management consulting company, PAC Productions. “Another lesson – don’t be afraid to take risks,” Castelli said. She moved back to the Detroit area in 1989 to help care for her ailing mother, and earned an MBA from Lawrence Tech in 1992 and a PhD from Wayne State University in 1994, researching the motivation needs of adult learners. She joined the LTU faculty as an adjunct professor in 1995 and began teaching at LTU full-time in 2000. “Another lesson, never stop learning,” Castelli said. Today, Castelli has won research awards for her work in reflective leadership, and has developed numerous leadership models and a framework for improving organizational performance. She said she’s continuing to conduct research in her field, as well in methods of improving teaching effectiveness, particularly in online delivery. Lawrence Technological University, www.ltu.edu, is a private university founded in 1932 that offers more than 100 programs through the doctoral level in its Colleges of Architecture and Design, Arts and Sciences, Engineering, and Management. PayScale lists Lawrence Tech among the nation’s top 100 universities for the salaries of its graduates, and U.S. News and World Report lists it in the top tier of best Midwestern universities. Students benefit from small class sizes and a real-world, hands-on, “theory and practice” education with an emphasis on leadership. Activities on Lawrence Tech’s 107-acre campus include more than 60 student organizations and NAIA varsity sports.